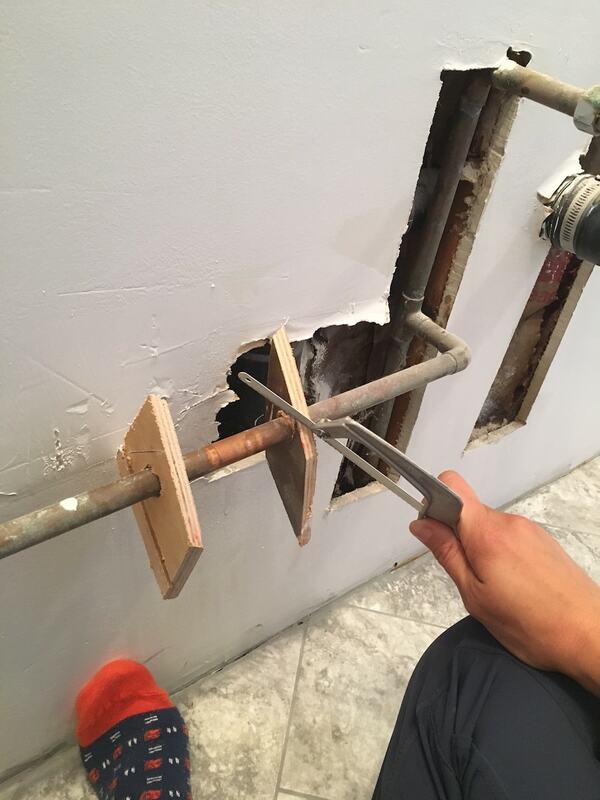 This post will walk you through how to fix big holes in drywall so that you can save money by not having to hire a handyman! When I moved into this older 1973 home back in 2010, I knew very little about home improvement. In fact, I literally walked around for 2-3 months with a ball of anxiety in the pit of my stomach because the house scared me! Not only did I not know how we were going to afford this larger home (I missed our smaller 2-BR condo), but I also didn’t know how in the world we were going to fix anything that got broken! I have to laugh at that silly young 30-something because the almost-40 year old woman that I am now is confident to tackle almost any home repair or improvement! But even though I am overzealous about home improvement and repairs, I still make mistakes. 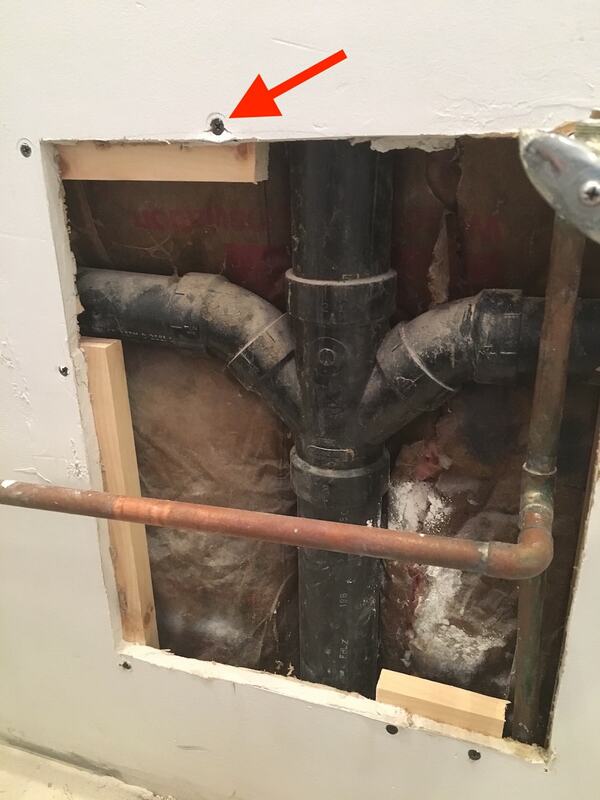 I’ll share some mistakes with you in this tutorial on how I repaired big drywall holes in our master bathroom. 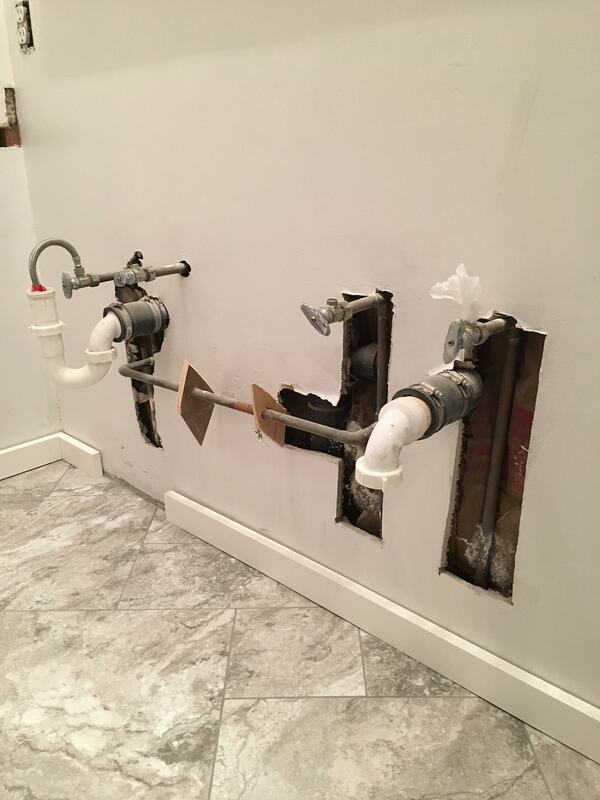 Hopefully, you’ll walk away feeling confident about doing this (and other) easy repairs so that you don’t have to hire professionals. 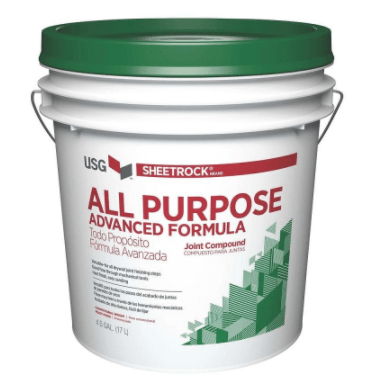 In order to repair drywall holes, you’ll need the following materials. STEP 1: Buy these materials. 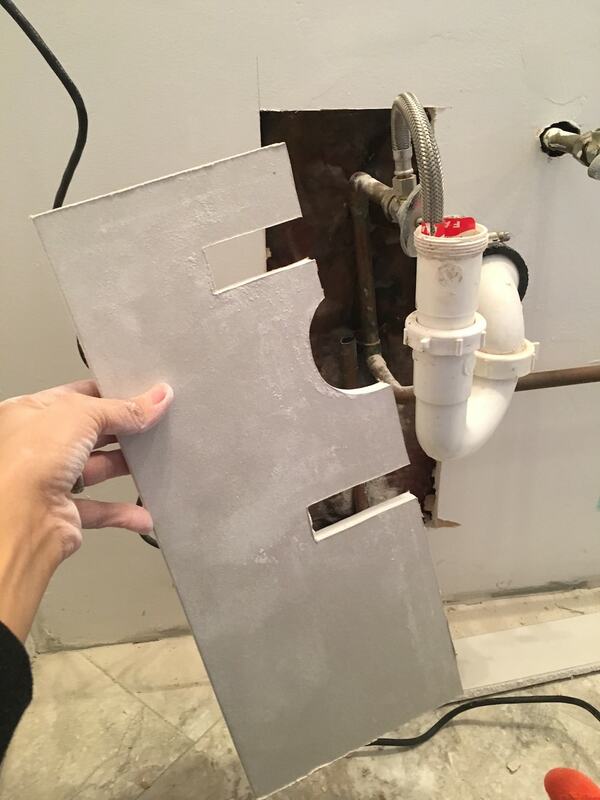 Jigsaw (optional, but necessary if you need to cut the drywall into special shapes to fit around plumbing). Oscillating tool that can cut drywall in a clean cut (optional), but may have a head attachment that can cut out notches, if necessary. STEP 2: Clear everything away. Behind the vanity, it looked like there had been some plumbing work done to the house years ago. And in order to do the work, they cut big holes in the drywall but never patched them up (laziness). 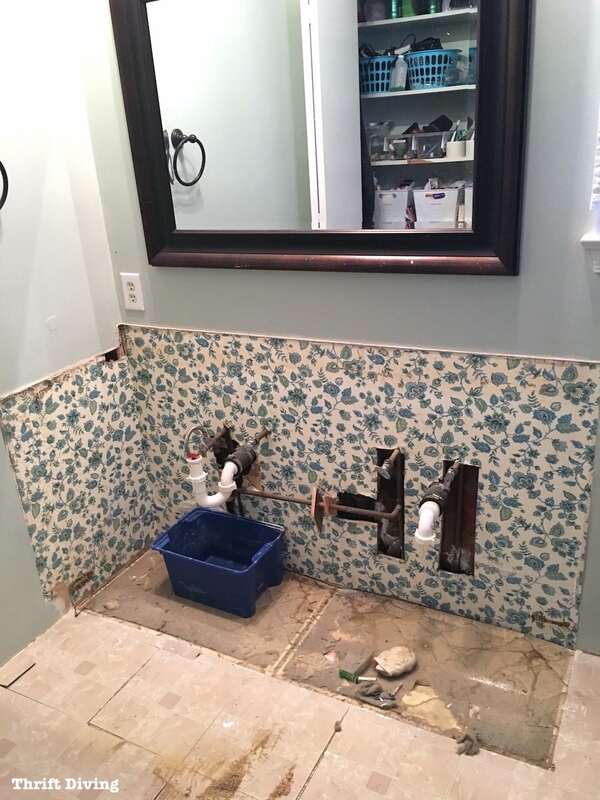 The old vanity was being removed, so this was going to be a good time to remove the wallpaper, paint, and fix the big drywall holes. If you have anything preventing easy access to the holes, be sure to clear it out. I’ll be honest with you–at first, I was going to be lazy, too. After all, who’s going to see the drywall holes anyhow?? 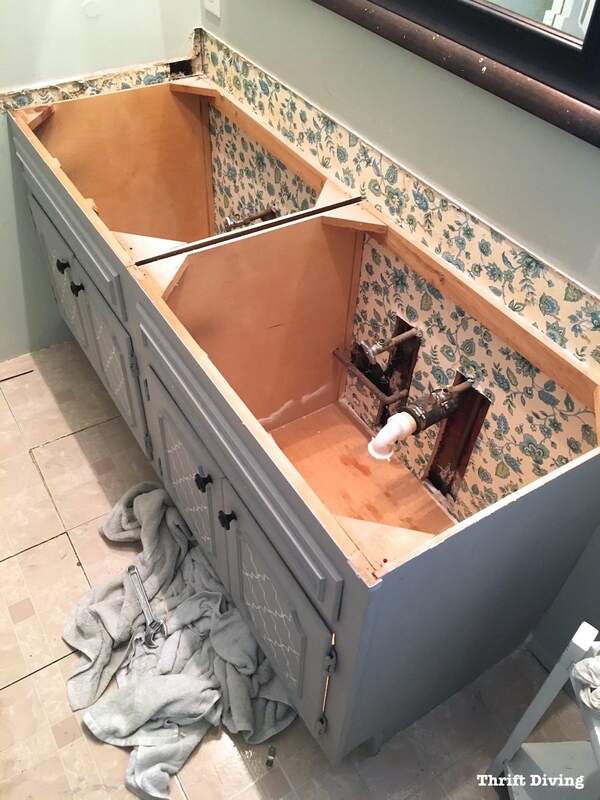 But I was going to be building this beautiful DIY bathroom vanity and the last thing I wanted to see when I opened the cabinet were huge holes in the drywall! Plus, big holes means moisture and bugs can get into your house. So, it’s best to put the laziness aside and just repair them. 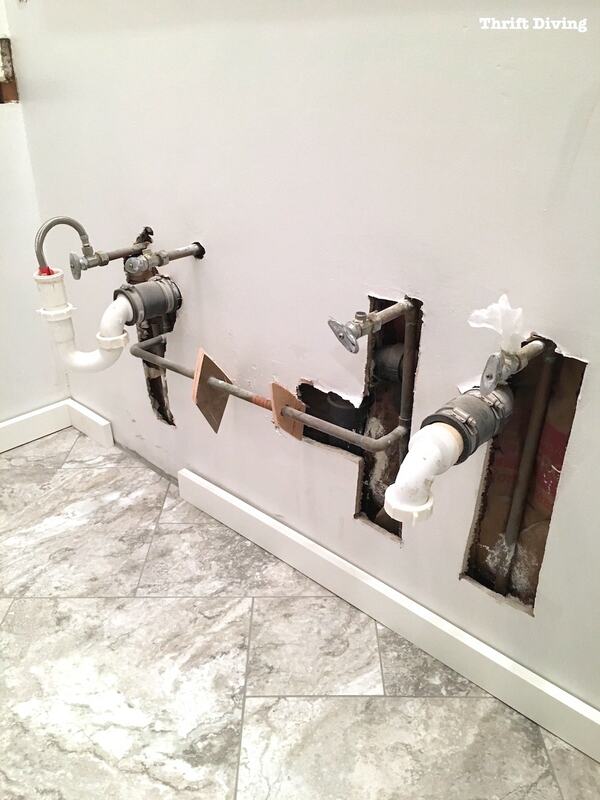 Since I had plumbing pipes to work around, I couldn’t remove those. But everything needed to be removed, including the old, ugly wallpaper. Plus, pieces of the old wooden vanity were attached to the plumbing where the old vanity had been cut away, so that needed to come off first. After a lot of sawing back-and-forth, I finally broke free the old wooden pieces of debris. STEP 3: Square off the holes. Holes are ugly and misshapen, aren’t they? You’re never going to find a hole that someone left that’s perfectly square. I can’t add a panel of drywall with the holes being all wonky and stuff. So the first thing I had to do was to make them as square as possible. 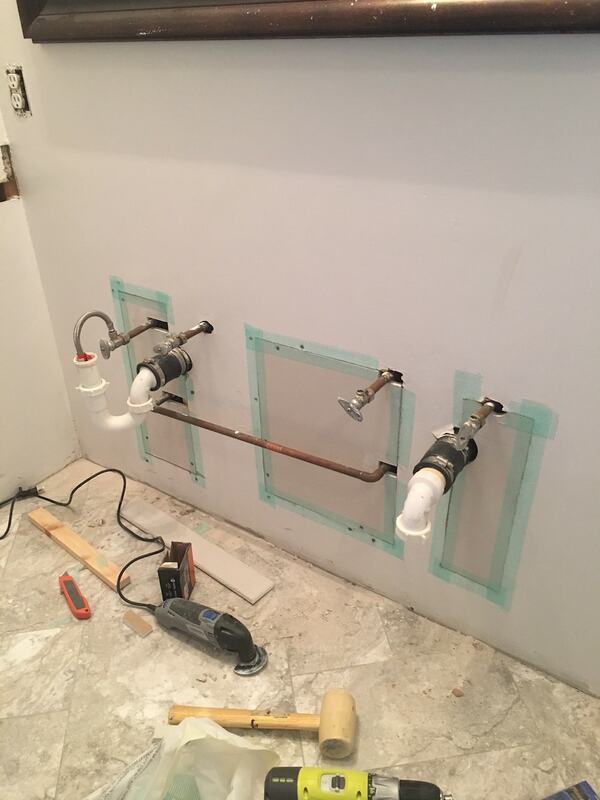 This was challenging because there were sensitive pipes involved and I dreaded cutting into any of them! So this part took a while for me since I was being so careful. In this picture below, you can see how wonky and misshapen they were. And unfortunately, I didn’t get pictures of this step where I squared off the drywall holes. But the idea is to use your ruler and draw a square or rectangle around the hole. Then, just cut away the misshapen parts until you’re left with a square or rectangle that can easily be patched. 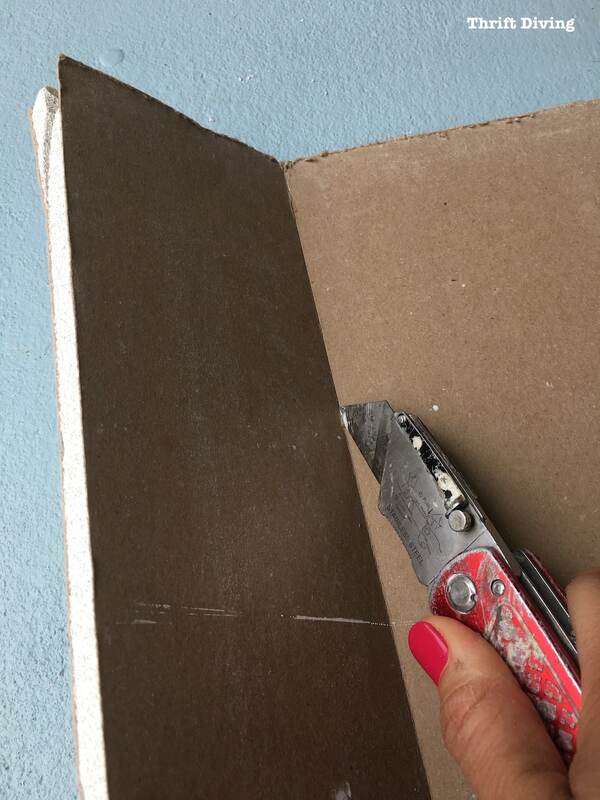 The tools you can use to do this are a utility knife or an oscillating tool with a blade that can cut drywall. I found the oscillating tool easier to use because I could trim the drywall opening more easily and it left a cleaner line. 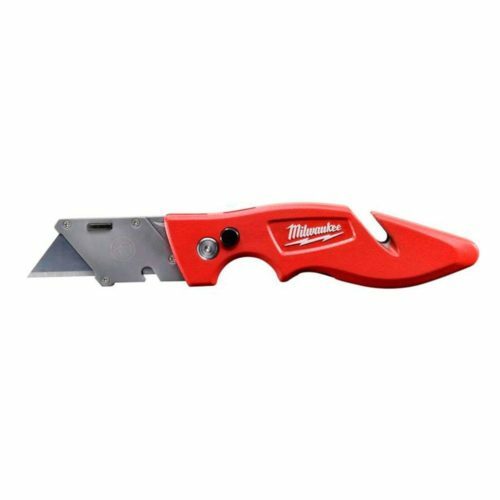 But a utility knife will work just as well. 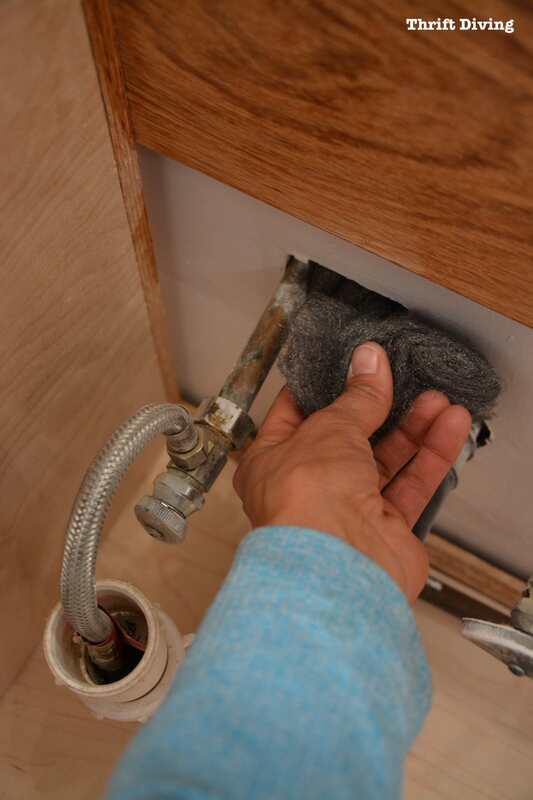 TIP: If the drywall hole that needs repairs is near the studs, try to remove enough drywall to the studs. 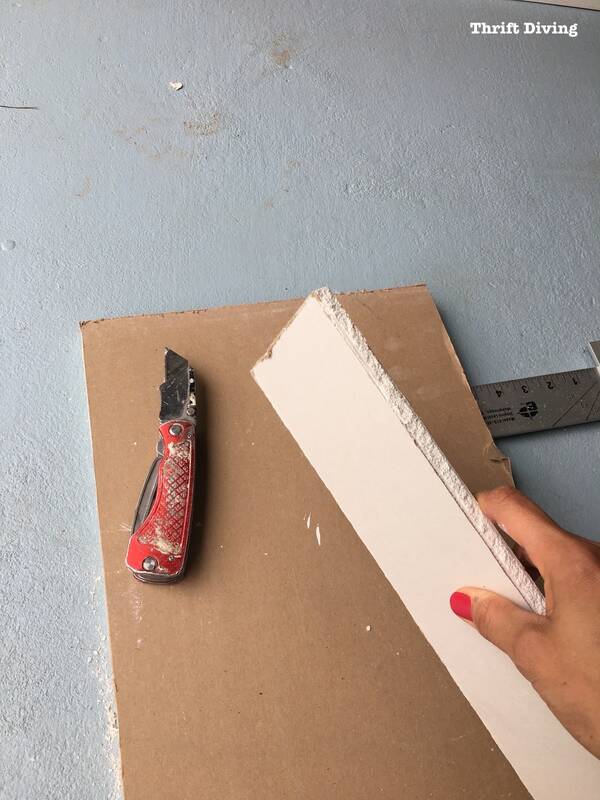 STEP 4: Cut an exact piece of drywall. 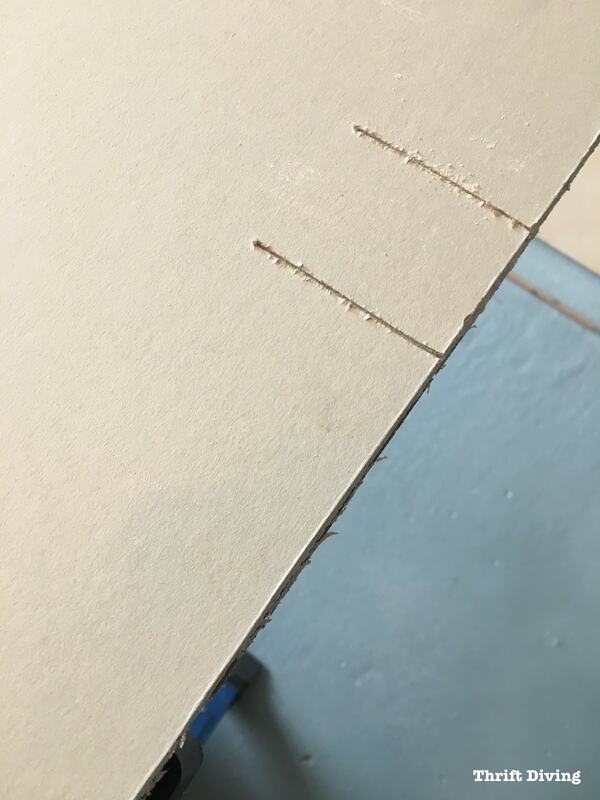 Don’t think you’ve got to lug one of those big 4′ x 8′ sheets of plywood home just to make simple drywall repairs. 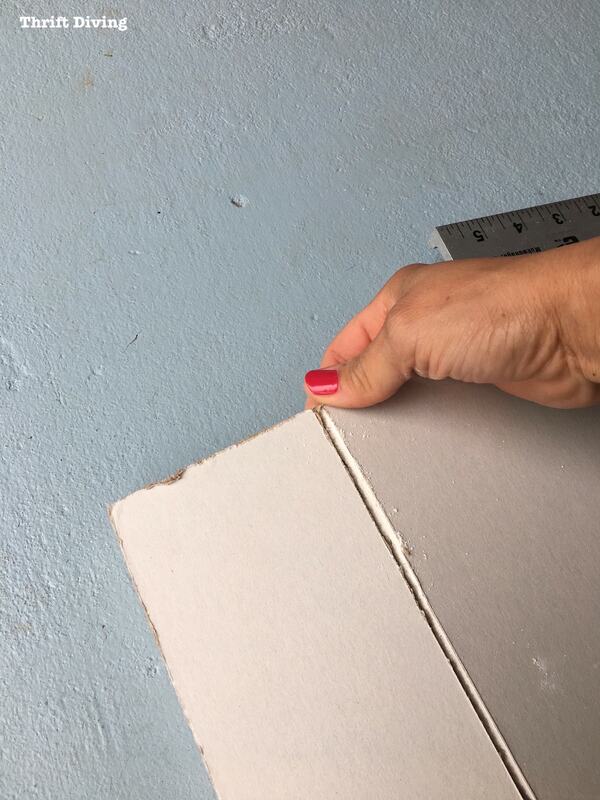 Did you know that home improvement stores sell smaller 2′ x 2′ squares of drywall?! 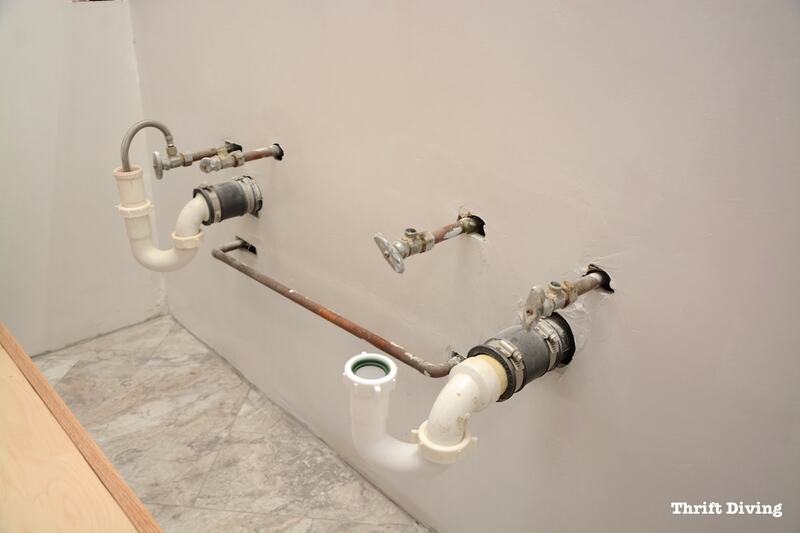 But these small pieces are perfect for large holes that don’t require a full sheet of drywall. You can get them at big box home improvement stores for about $5.00 each. Straight cuts are no problem. Just score the front a few times (using a ruler or a T-square to keep your line straight). After a few scores with the blade, just snap the drywall in half. It literally snaps that easily! Turn it over and slice through the back of the paper that’s holding the drywall together. That easily, you’ve got a piece of drywall! 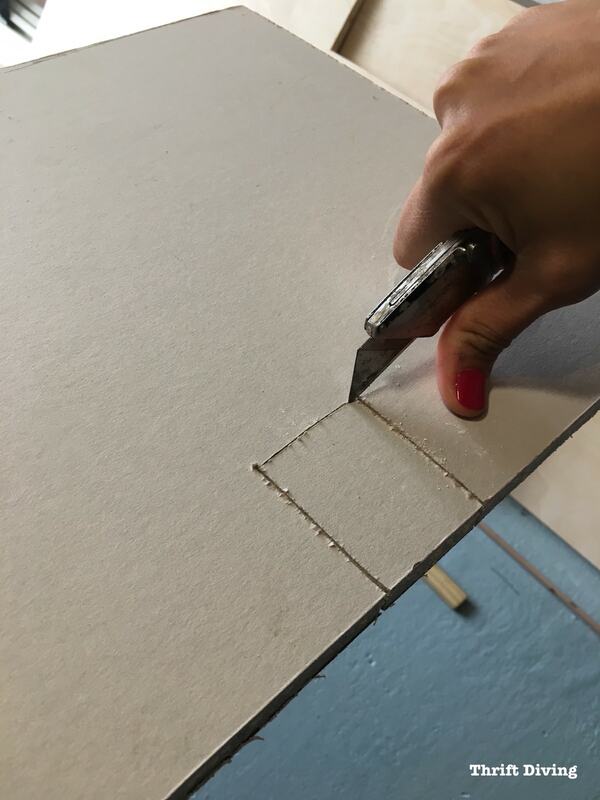 If the drywall repair is similar to mine and you need to cut notches, too, you can use a drywall knife, but I found that using a jigsaw was faster and easier. …then use a knife to score the piece. When you give it a snap, it should easily and cleanly break. Just turn it over and cut it free from the paper backing. And voila! 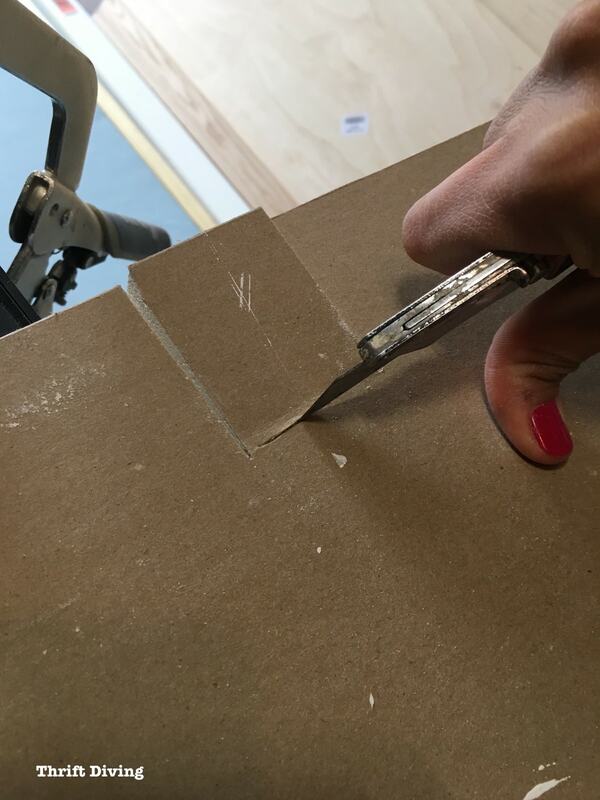 You can cut out notches in drywall! (FYI….Sometimes you need to make cutouts for electrical sockets. 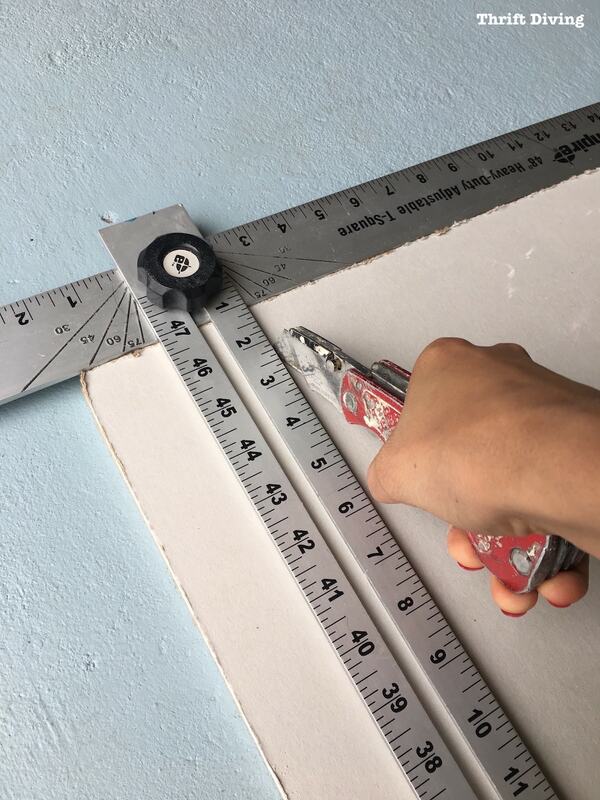 In order to get your jigsaw or drywall knife to start cutting in the middle of drywall, you’ll have to drill a small pilot hole with a drill and then insert your blade into that hole in order to start your cutting in the middle of the drywall). Even though I tried to measure as accurately as possible, the best way to fix the big drywall holes was to just test fit it as I went. I made sure the pieces were snug. Again, I used a jigsaw and a tape measure to cut the piece to the exact size. I had to make several adjustments to get it to test fit snuggly. This one wasn’t as great of a fit, but it was a difficult fit! 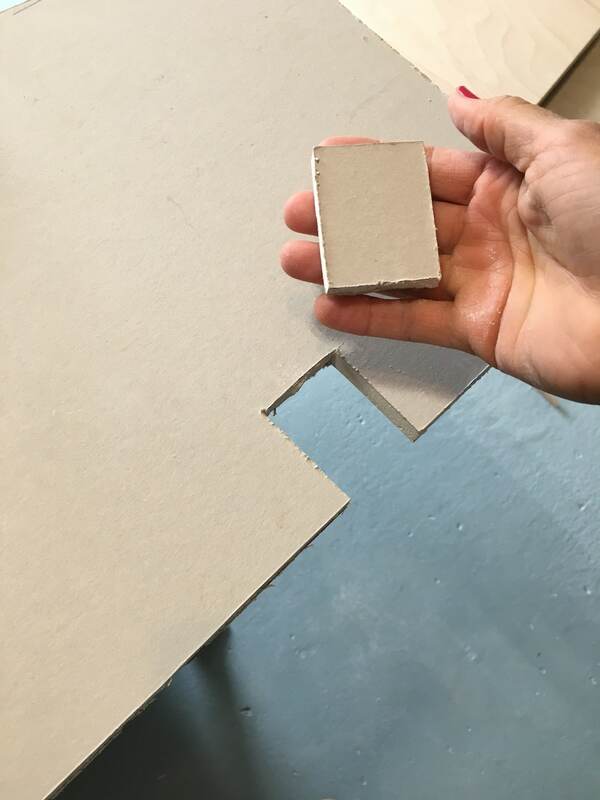 Now that the pieces are tested, support can be added inside of the drywall hole. 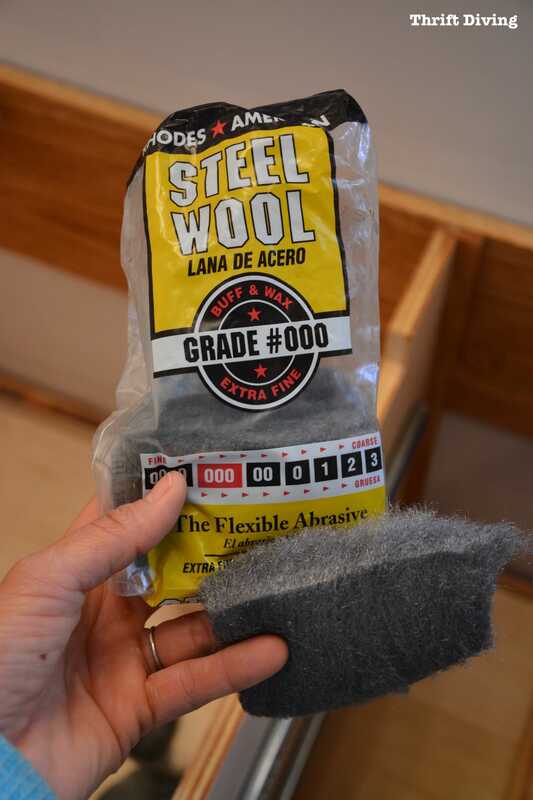 Furring strips are nothing more than strips of wood (although they can be of metal, too) that can provide structural support (sometimes they’re used behind crown molding for extra strength when nailing up crown molding). You can just go to Home Depot and ask for furring strips in different sizes. In this case, I just used scrap pieces of 1″ x 3″ wood that I had lying around. 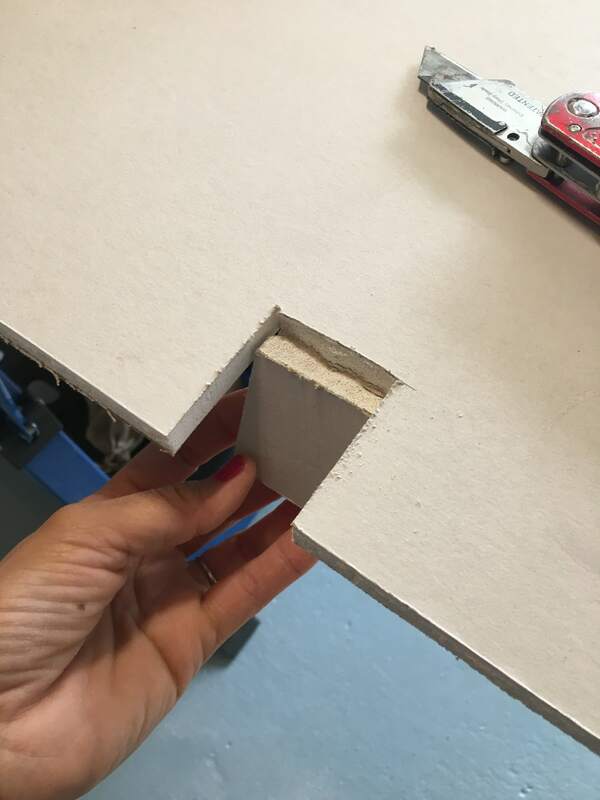 The reason why this step is important is because these pieces of wood will give the new piece of drywall patch something on which to attach. Typically if you can attach one long board, you should, but in my case, the pipes were in the way. So I had to place various pieces around the drywall opening. 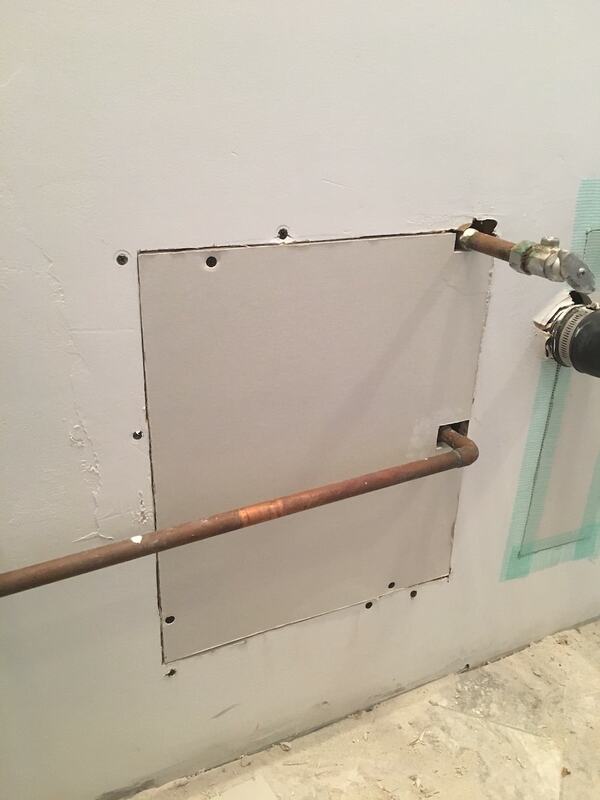 (And if your hole is located near studs, you can clear away enough old drywall in order to attach the new drywall patch to the studs. Otherwise, these new pieces of wood you added will work just fine. 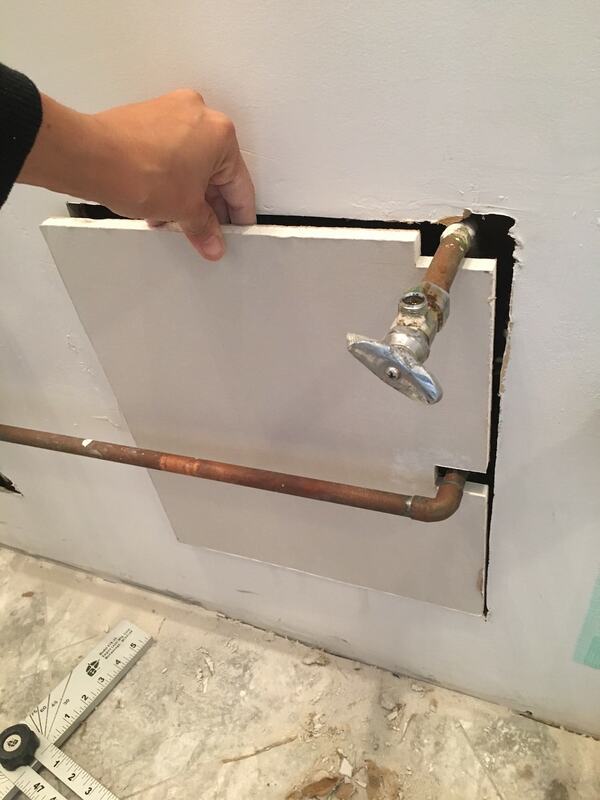 You’ll notice that I drove screws into the existing drywall, securing the pieces of wood inside the hole, to the back of the existing drywall. A couple of things you need to know: 1) use drywall screws, and 2) use a drywall screw setter. 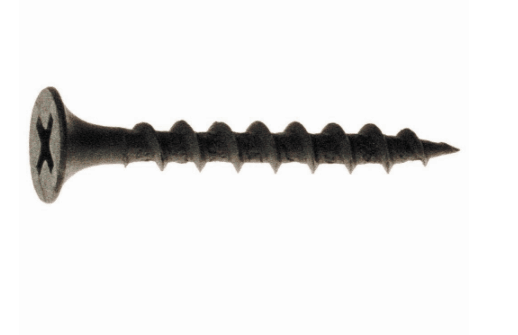 I used these 1-1/4 inch Grip Rite drywall screws (Look for the ORANGE packaging in the screw aisle at Home Depot). 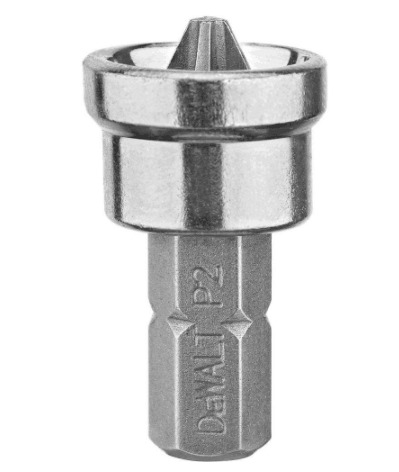 I also used this drywall screw setter bit in my power drill to drive the drywall screws. What’s different about this drywall screw setter it is that the small collar on the bit prevents the screws from going all the way through the drywall. 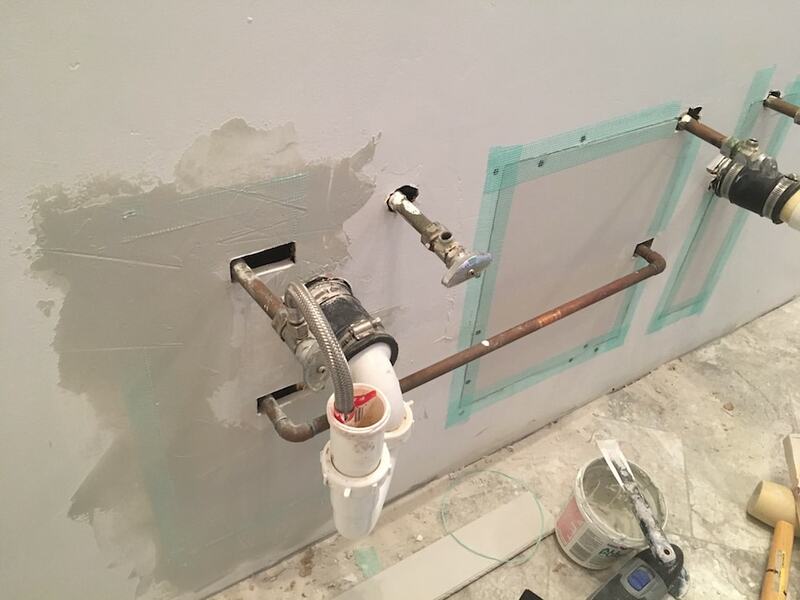 And it will actually create a divot in the drywall so that the drywall screw can be covered with drywall mud (otherwise known as joint compound) so that the screw won’t show. Notice here how the screws are below the surface? Once the panel is put in place, I will use additional drywall screws and secure the drywall patch to the wood for support. This will stabilize the drywall and prevent it from falling through the wall. At the beginning of these drywall repairs, I totally forgot that I needed to add wood support inside of the drywall hole! Now you’ve learned from my mistakes, right?? Once the drywall patches were screwed to the wood supports, I added drywall joint tape to the joints. 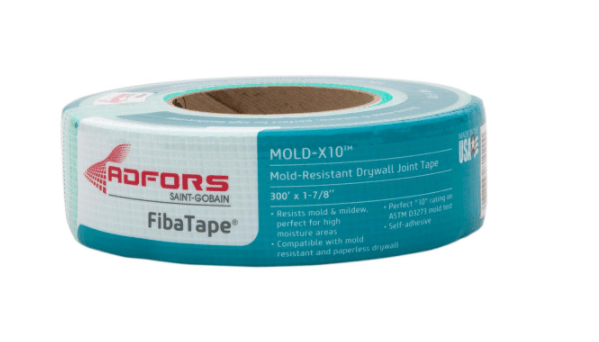 I decided to get mold-resistant joint tape since it’s a moist bathroom. There was one panel that I decided to leave wedged in and not use drywall screws. That piece was such a tight fit that I decided to just leave it with no support. I wouldn’t recommend that. But since it was such a tight fit, I decided it was easier to leave it in rather than work to remove it. Plus, since it’s behind the vanity, it’s unlikely that anyone would ever push on it enough to make it fall through. Anyhow, to cover the joints, just use one piece of tape, overlapping them at the corners. 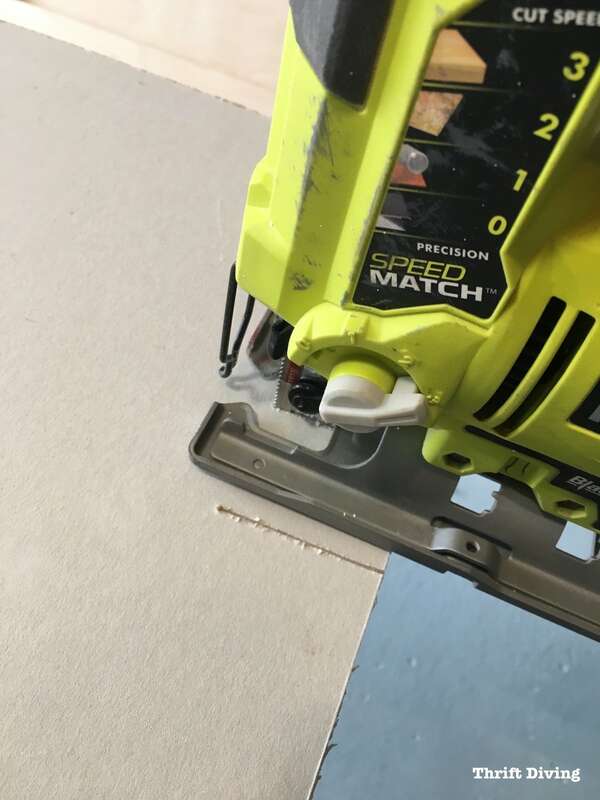 Once the joints have been taped, use a putty knife that’s about 6″ and spread it around over the taped joints, feathering it out so it’s not too thick. If you need to add two coats, then come back after it dries, sand smooth with maybe 150- or 220-grit sandpaper, and then add another coat. When done correctly, you shouldn’t be able to see the joint tape. After you’ve added 1-2 coats, be sure to sand the wall as smooth as possible. Wear a dust mask so you don’t breath in the fine particles floating around the room! Now that the walls are smooth and you can no longer see the damaged areas, it’s time to prime and paint the wall. Most paints have primer in them, so I usually skip a separate primer and just add two coats of a paint-primer combo. In my bathroom, when all was said and done, this is what the wall looked like afterward. It was hard to mud around the pipes, so those areas are bumpy where I couldn’t spread the joint compound so smoothly. Later, I added some fine steel wool in the holes around the pipes to deter any rodents or spiders that may ever try to get in! So….Do You Need to Hire a Handyman? Nah….not for this job. 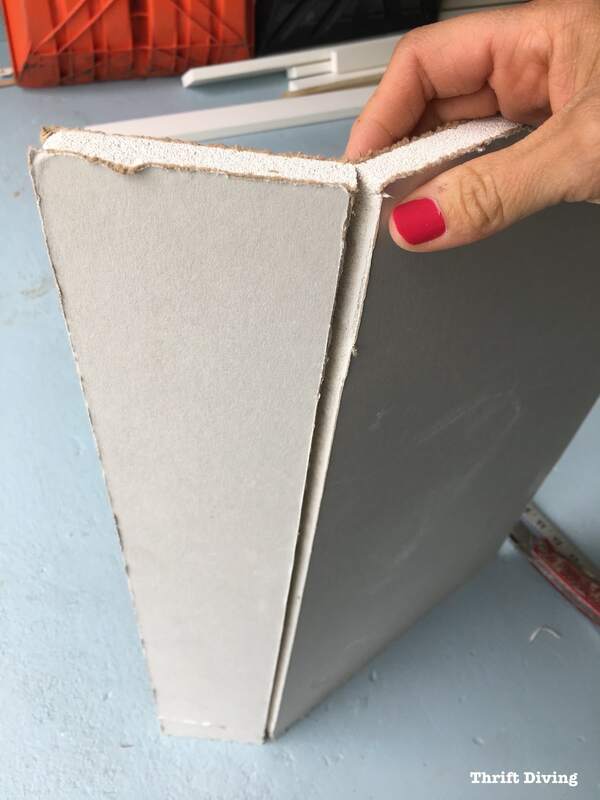 Drywall repair is really an easy DIY project you can do yourself in about 1 hr or less. This was actually the first time that I had fixed drywall holes. And if I can do it, so can you. Here is a video tutorial that was very helpful for helping me fix my drywall holes, and I think you’ll find it helpful, too. Did you find this helpful? 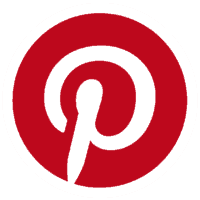 Save it for later on Pinterest! 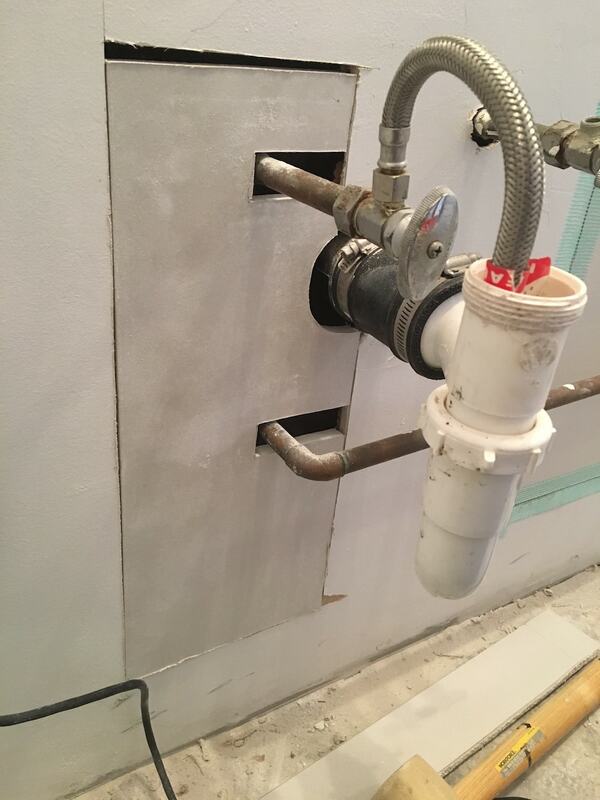 Have You Ever Fixed a Big Drywall Hole? 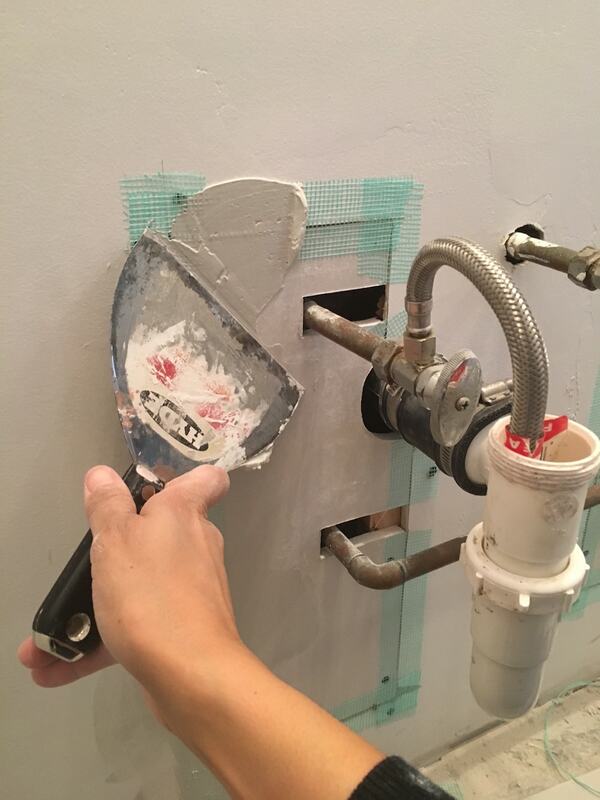 Wow, it’s amazing how made your DIY on fixing big holes in drywall repair. 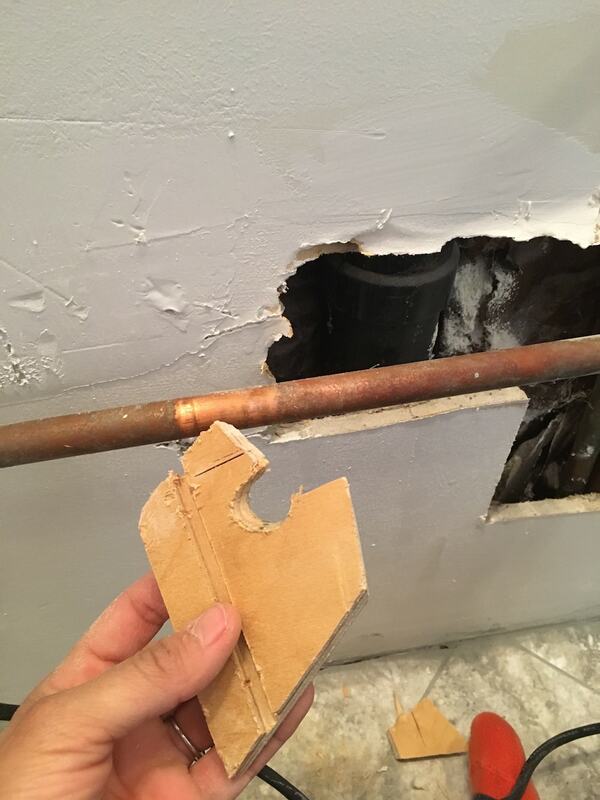 I haven’t tried this one because I thought it is not possible to do it on my own but when I read your article, I am so excited to start my first DIY on big holes dry wall repair. Good work! Thanks a lot. I’m not sure how to repair!! And smooth out the floor so that I can paint the floor?? Thank you so much for this! 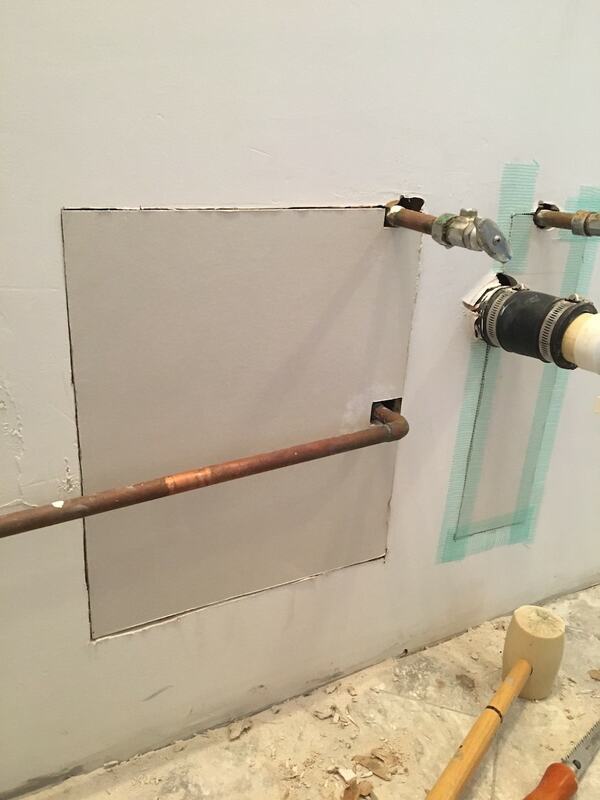 We patched a hole! We had the valves replaced for our washing machine’s water lines and the guy left a real eyesore of a hole in the wall. Your pictures and instructions were so helpful, and I keep telling everyone about this post and your site. Thank you again ? Love the tutorial! I have some drywall in the garage that needs to be replace and you made it look easy peasey. Thanks for commenting! Glad I could help. We are about to do some of this and you sure made it look easy! Just like a pro…oh wait. You *are* a pro! It looks terrific.